All of these girls have been spayed and are our beloved pets. Above: Blossom balanced across the top of the flat-screen TV. Right: Blossom on a cat tree with her last litter, our fabulous TWERP BOY!!! We LOVE LOVE LOVE our little Twerp! This is our "cover girl." It's Blossom whose image appears in our logo that Charmaine Keller designed for us. Blossom is OUTSTANDING. We LOVE her huge eyes and her ears, and her long legs, graceful body, etc., etc. as much as Barb did. I think those eyes come from the famous Azima's Ellie Gantz, her mother, but Blossom's white coat shows off the size of her blue eyes to perfection. Blossom is deaf, but we haven't broken the news to her yet. She does just fine on her own, thank you very much. She loves to drape herself over the plasma TV or our left shoulders and keep us company as we walk about the house. I find Blossom so breathtakingly beautiful AND so much of a character that you'll find many photos of her in the Photos section on Candid Photos page 1. We're thankful that Blossom's huge eyes trait is a strong one. She's passed it to her daughter Crystal; Crystal's older sister Gilda; and her younger brother, our gorgeous Bizans' Sweet William (Twerp Boy to his friends). 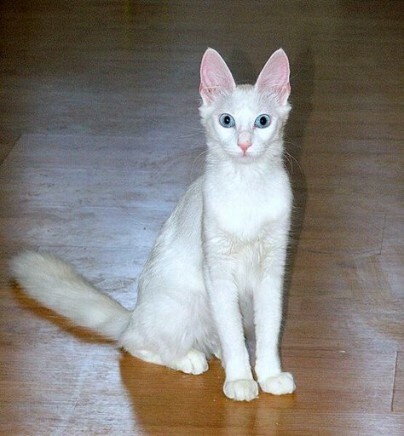 And Crystal has my favorite color combination -- odd-eyed white. Crystal is a delicate, little bit of a thing who LOVES to hold my head between her front paws and bite my hair. I try to discourage her from this activity. Fortunately, she enjoys being held in my arms for more conventional expressions of affection. She's deaf, too, but tells us it's no problem for her either. She's curious about everything, exploring every nook and cranny in the house. Crystal showed quite well as a kitten, and we are looking forward to taking her out again for her championship. 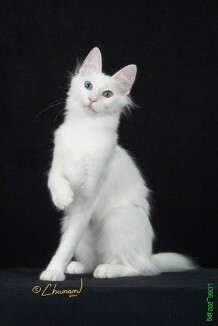 Her photo was used in advertisements for 4 TA breeders in the 2011 Kittens USA magazine, and the 2011 Cats USA magazine. Kiri is my heart cat, the living love of my life after my Ayshe died. I named her for the New Zealand opera singer Kiri Te Kanawa for various reasons, along the lines of the six degrees of Kevin Bacon. In 2008 she gave birth to Kaby (short for Kiri's Baby). Kaby was sent to Rome, Italy, as stud for Angelicats' girls, owned by Giovanni d'Amore. Kaby has learned Italian and is producing some top-winning, gorgeous kittens and cats in European and Russian cat shows. I'm so proud. We're putting Kiri back with her "first husband," Azima's Sterling Splendor (Silverado) for a repeat breeding. The world can certainly do with some more Kabys! Our Mira girl, with her brother Little Legacy (in English), were the last litter Barb Azan bred, and they were born in our home 3 weeks after Barb passed away. That adorable red stripe down her nose is particularly appealing to cat show judges and "regular people" alike. So cute! And what an insistently affectionate cat! Holy cow! She has to be pet fairly vigorously before she settles down for some "normal, just plain" petting. We have our hands full with this one, but she's all love. Mira was bred to Walker and presented us with FIVE beautiful kittens you can see on the Kittens page. She's SUCH a good momcat, like her mom, Azima's Abra. Flash, one of our adorable tortie smokes, is one of the last cats we have who was filmed at Barb Azan's house and appears on Animal Planet's Cats 101. I named her for that flash of color by her right eye. 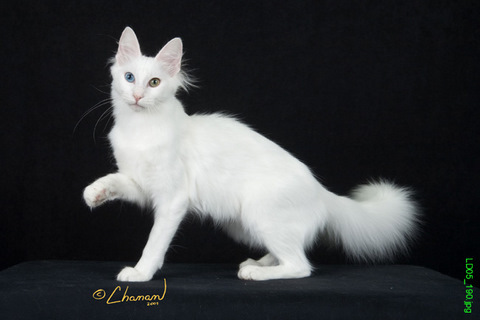 She's another sweetly affectionate Azima girl, and she passed on this trait on 9/1/10 to her two gorgeous boys, Cosmic Latte and Red Star Dancer, whom you can see on the Kittens page.